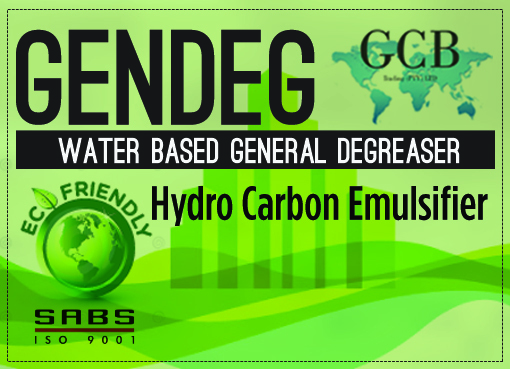 GENDEG is a highly concentrated 100 % environmental friendly safe, biodegradable heavy duty degreaser and hydro carbon emulsifier, for use in the industrial, household, hospitality, abattoir, mining, agriculture industries. GENDEG, has been approved by the Department of Water Affairs, for safe discharge into any drain/storm water drain. One of very few products in its class in South Africa to have been approved by (DWAF). No Chemical without the above approval may be discharged in any drain whatsoever! GENDEG serves as an Emulsifier, meaning, where GENDEG is applied it stops the Hydro Carbons from penetrating further on the surface where the spill is. So stopping contamination of the area.